This card, like Endymion, the Master Magician and Crusader of Endymion, are named for the Greek mythological figure of Endymion who was beloved by the moon goddess Selene and put to sleep forever. The Citadel has a striking similarities to the town of Geffen in the online RPG game Ragnarok Online. Both have a circular perimeter, a tall tower in the center, architectural buildings, and most of all, both are a town of spellcasters (mages and wizards in Ragnarok). Citadel appears in the artwork of Fusion Recycling Plant. The effect of "Magical Citadel of Endymion" which places Spell Counters on itself when a card with Spell Counters is destroyed does not start a Chain. The effect "Once per turn, if you remove a Spell Counter(s) from your side of the field to activate the effect of a card effect you control, you can remove the Spell Counters(s) from this card instead." of "Magical Citadel of Endymion" can only be used for costs. It cannot be used when an effect like "Mythical Beast Cerberus" removes Spell Counters. : Can you remove Spell Counters from "Magical Citadel of Endymion" instead of removing Spell Counters from "Mythical Beast Cerberus"? The activation of a Spell Card, as mentioned in the text of "Magical Citadel of Endymion"/"Skilled White Magician"/etc, is when you play it face-up from your hand, or when the Spell Card is Set and you flip it face-up. It does not include activating the effect of a Spell card which is already face-up on the field, such as when you activate the effect of "Wave-Motion Cannon" or "Inspection". "Skilled Dark Magician" etc will not gain a Spell Counter when you activate the effect of "Wave-Motion Cannon" etc. : Is a Spell Counter placed on "Skilled White Magician" when the effect of a Continuous Spell Card is activated? "Magical Citadel of Endymion" will gain Spell Counters if a card on the the opponent's side of the field is destroyed while that card has Spell Counters on it. Also, if both players have activated a "Magical Citadel of Endymion" and a card that had Spell Counters is destroyed, the effect of both copies of "Magical Citadel of Endymion" is applied and the same number of Spell Counters is placed on each of them. : When an opponent's card is destroyed, do you apply the effect of "Magical Citadel of Endymion" which has it gain the Spell Counters of the destroyed card? 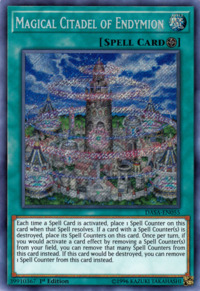 The effects of "Skilled Dark Magician" and "Skilled White Magician" are not activated by removing Spell Counters, so you cannot remove the Spell Counters from "Magical Citadel of Endymion" instead, regardless of the number of Spell Counters on "Skilled White Magician". : Can the effect of "Skilled White Magician" be activated by removing three Spell Counters from "Magical Citadel of Endymion"? 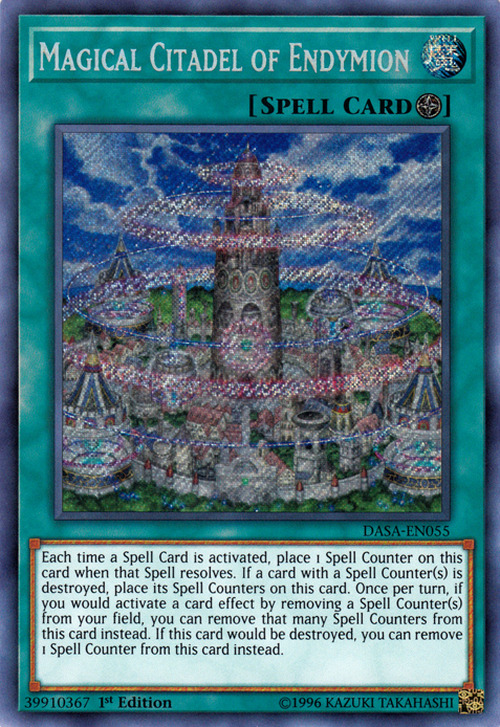 When you use the Spell Counter-substituting effect of "Magical Citadel of Endymion" to activate an effect, all of the Spell Counters to be removed must be removed from "Magical Citadel of Endymion". When you activate the effect of "Royal Magical Library", you must remove all three Spell Counters from "Magical Citadel of Endymion" if you are using the effect. : By removing Spell Counters from both "Magical Citadel of Endymion" and "Royal Magical Library", can you activate the effect?